I kept meaning to post a new blog after I returned to the U.S. post-Rio, but I consistently found myself making excuses–too busy, nothing to say, technical glitch (whoops–entry deleted!). The truth is, I am still in the process of re-acclimating to life in sunny southern California, and sorting out my feelings on being home, on what the significance of my experience abroad truly meant to me, and on how I perceive these two vastly different cultures–U.S. and Brazilian–once the chaotic surges of transitional emotions have ebbed (this still hasn’t quite happened!). My plane departed Rio for the States on November 10th, and some very, very dear Brazilian friends refused to allow me to leave the country without sitting with me at the airport until it was time for my plane to board, in spite of all my protests. I wanted to quietly sulk off, to sit with all the complicated, bittersweet feelings of sadness and anticipation alone, but my wonderful friends would have none of it, and it meant the world to me. I will never forget our airport antics as we gleefully posed for silly pictures and I shouted farewell laughingly in melodramatic, broken Portuguese. All the while, my heart was breaking, as these friends had become some of my closest on the entire planet, and I didn’t know when I might ever see them again. My pre-departure days felt like a whirlwind, as my 7-month-old Yorkshire Terrier, Harley, needed to have all the proper paperwork filled out as well as an airline-approved travel bag for the journey, I had loads of things to pack (and give away, as there was no way I could fit it all back in my suitcases, which were now stuffed with puppy toys), and there was simply not enough time in the end to see everything I had hoped to see (next time, Jardim Botanico!). The week before departure, I truly did not want to leave. Rio felt like home, and I was finally beginning to feel like a real Carioca, a Brasileira at heart. I probably would have gone super-emo and spent my last hours in Ipanema listening to cheesy, mournful melodies if it weren’t for the distraction of my terror at the thought of traveling 20 hours in an airplane cabin with my puppy sealed inside a Sherpa bag. I had absolutely no idea how he would behave, and I had awful fantasies about him howling in the cabin for tense minutes on end, or even escaping and scurrying around the plane underfoot of unwitting passengers. It is surprisingly easy to travel from Brazil to the U.S. with a pet, as long as said pet is vaccinated and has a pre-departure check-up and papers. It was equally easy to purchase Harley’s plane ticket: I wish my fare only cost 150 bucks as well! I was surprised that the airline didn’t ask me any questions about his behavior; they just wanted to make sure that he was under 15 pounds and would fit in a bag stowed beneath a seat (he is 8 lbs, so, yes, he does). He did amazingly well on the 20-hour journey home. We had a brief layover in Houston en route to Los Angeles, and his “inspection” consisted of some airport personnel asking me if he bit, and joking about how vicious he looked. To my surprise, he did not utter an entire peep the entire time (really–no one would have ever known I had a dog with me on the airplane!). He whined a tiny bit in Houston (he had to pee, after 12 hours–I would have been whining a lot more loudly if I were him). It seemed apropos at the moment. I had my purse draped over one shoulder, and my dear Harley in his Sherpa bag over the other, as I descended down the escalator to the baggage claim area, when my entire family came into view: my mother, father, brother, sister, all of whom I hadn’t seen in ten months, smiling expectantly, joy lighting up their faces. My sister had even made a giant poster proclaiming “Welcome Home!” with Harley’s likeness painted on it (she is an artist)! That moment, seeing them all standing there, together, waiting for me, feeling the gravity and magnitude of the journey I had just made, the weight of the responsibility of safely transporting my dog-baby half-way around the world lifting, feeling far away from a world I had inhabited for months, seeing the love and excitement on the familiar faces of the people who know me better than any other on earth, realizing how small I am, and vulnerable, the world suddenly felt very large and I felt very humbled. 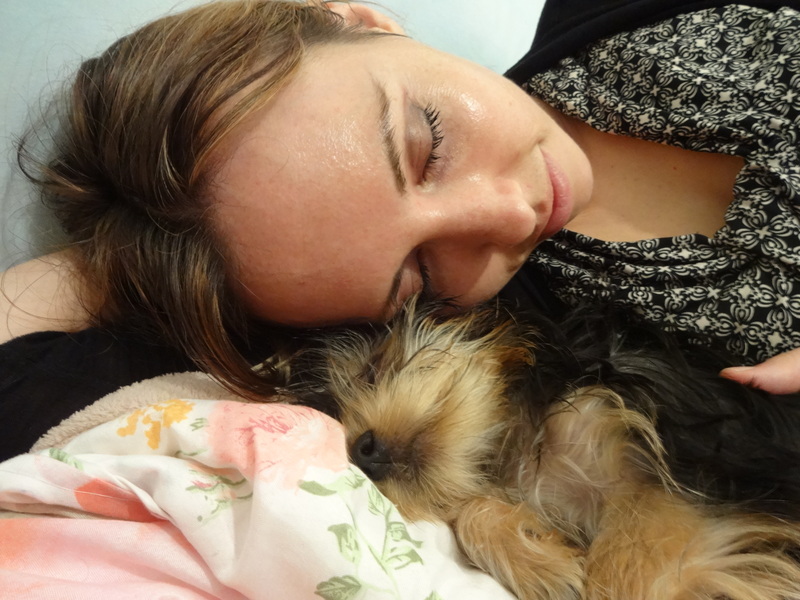 A rush of emotions coursed through me, and I looked down at little Harley, tucked in his bag, and back up at the “Welcome home!” sign, and I burst into tears of relief, joy, fatigue, saudades do Brasil, and gratitude. It was a moment I will never forget, a fitting ending for one of the greatest journeys in my life. As part of my Fulbright duties at the Federal University of Rio de Janeiro (UFRJ), I lead seminars on a semi-regular basis. The common thread running through each talk is some aspect of American culture. I have presented workshops on “American Folklore and Brazilian Myth,” “Road-Tripping Culture: Into the Heart of America,” “Breaking Barriers: Debunking Common US and Brazilian Stereotypes,” and “Pet Culture in the United States,” among others. Leading these seminars is one of my favorite UFRJ assignments, as it allows me to creatively present interesting topics while helping to break down cultural barriers and promote U.S.-Brazilian understanding. This past week, I presented a workshop which was probably my most popular ever. 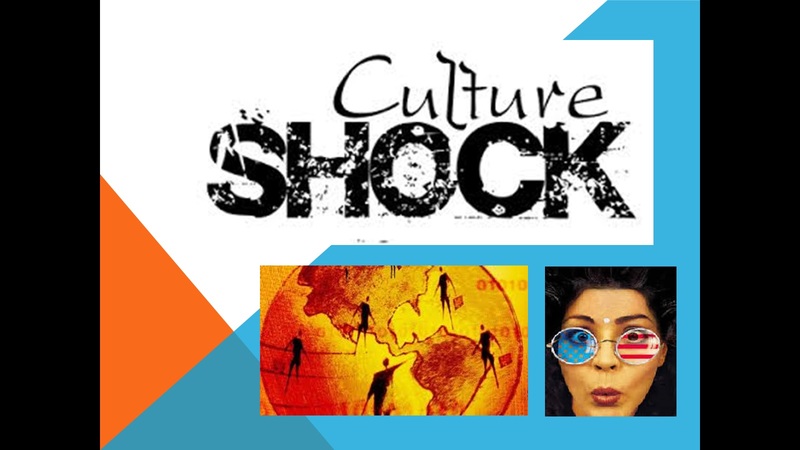 In it, I discussed culture shock, providing examples based on my personal experiences in Brazil, and advising students on how to prepare if they plan to study abroad in another country, such as the United States. I say the workshop was my most popular ever because every seat was occupied and the students didn’t want to leave when the presentation was over. They had so many questions about culture shock and about navigating complex cultural differences. I think this topic is timely and important, and have decided to post to my blog the contents of my presentation, so that readers here might also benefit in learning more about how to prepare for life overseas. Enjoy! A wave of anxiety rumbled onto the shores of my mind this afternoon as I sat hunched over a laptop in my small Rio kitchen, browsing jobs, and PhD programs, and conferences that I really should attend back home (regardless of the fact that the academesian jargon is spread so thick in seminar descriptions that just reading about sessions makes me feel like I am descending into a buttery morass). The stress of any big transition leaves us feeling overwhelmed, usually, but I don’t want worries about an unknown future to taint the end of my time in Brazil. Rather, I wish to focus on retaining the lessons I have learned here, remembering who I have become, and focusing on building the life back home which I have realized that I want. When I return to the U.S., I will not retrogress into the conventions of strip malls, mystic tans, and iPhone-infatuation. I want to live somewhere where I can walk to a coffeeshop in the morning, to the grocery store, to a public park, to the metro or subway station. I will continue to live in the moment, rather than tying myself to a virtual world which I am constantly peeking at over my shoulder instead of of being fully present. I want to keep life simple. To enjoy walks on sunny days, and relish good food and coffee or tea, and get outside and relish the landscapes, whether urban grit or green. I want to play with my dog, savor time with my partner, and keep reading lots of books (I am up to 19000 pages and counting for this year). I want to stay humble, and to remember the lessons about pretension I have learned here from some of the most unpretentious people I have ever met. 1) Stroll the Botanical Gardens (Jardim Botanico). I can’t believe I still haven’t been there after eight months in Rio! A 147-hectare garden with over 8000 species of plant, designed by royal decree of Emperor Dom Joao. 2) Climb a mountain: whether it be Pedra da Gavea, or Pedra Bonita or Pedra-something else, I want to enjoy what is touted as one of the best hiking experiences in Brazil. 3) Visit the Tijuca forest, the world’s largest urban rainforest. Hope to finally see a sloth! (one can always hope). 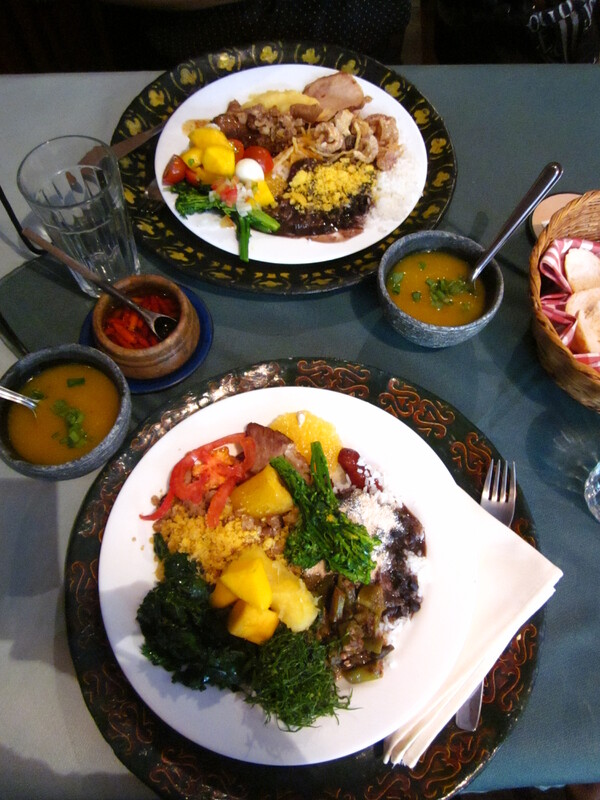 4) Indulge in Amazonian fare like tacaca and jambu at Tacaca do Norte restaurant in Flamengo. 6) Visit the Copacabana Fort Museum. It’s within walking distance of my apartment, so I have absolutely no excuses. It is described as “one of Rio’s [historic] premier defenses against attack,” (LonelyPlanet) with a museum tracing the history of the earliest Portuguese colonists. 7) Finally make it to Intihausi in Flamengo for what is described in online guides as “mouthwatering” Peruvian food. I don’t know where the heck in San Diego I will find Peruvian food, let alone fare that is delicious and authentic, so I’ll indulge while I have the chance. 8) Spend at least one (or ten) last day(s) laying out on the beach at Ipanema, fresh coco verde in hand, Havaianas and canga at my side. 9) Visit the Museu Historico Nacional in Centro, which contains relics dating back to Brazil’s founding through its early days as a republic. One reported highlight “is the quill that Princess Isabel used to sign the document abolishing slavery in Brazil.” (LonelyPlanet). As of today, I have been in Brazil for exactly 188 days. Six months and one week. Summer to winter. Enough time to become adept at navigating the streets of Zona Sul, learn the fastest metro routes to various destinations around Rio, make new friends (Brazilian and expat alike), learn enough Portuguese to impress a few Brazilians (although it’s still not particularly impressive, in my opinion), read dozens of books on my Kindle, holiday around the country, experience the World Cup, join a book club, gain a little weight and lose it again, change my hair color, establish myself as a “regular” at my favorite neighborhood restaurants, buy a dog (yes, I bought a Brazilian best friend and I am crazy about my almost 5-month old baby), start attending dog obedience school with said pup, attend the FLIP literary festival in Paraty, miss home like crazy, decide I want to stay in Brazil forever, have terrible days, wonderful days, and generally learn more about myself and the world. I have 2 1/2 months left here, until my Nov. 10 departure, a departure which will be infinitely more complicated now that I will be travelling internationally with a 7-month-old, 6-pound pooch. I have seen things in Rio that I will never forget. I have lived through protests in Copacabana, a hostage being held at a gunpoint at a church just blocks away, the echoes of firefights at night in the Cantagalo community just above my apartment. I have seen the consequences of horrific accidents on the mad streets of Rio, with all of its congestion and crazy driving. I have also seen places so incredibly beautiful they will be emblazoned into my mind forever, and experienced the compassion and warmth of dozens and dozens of Brazilian people. Being here, and thoughts of leaving here, are very bittersweet. I miss my family so much, yet there is so much I don’t miss at all about home: my beat-up 2000 Toyota Celica, and driving in general, the strip malls and freeways and traffic. I wonder how I will make do without pao de queijo and acai and aipim frito and brigadeiro, fresh fruit and cafezinho in the morning, just as I wondered how I would EVER survive in Brazil without my Vita-Mix (which now sounds utterly laughable to me). My pup Harley, a Yorkshire Terrier, is welcome at various dining establishments around our neighborhood, where we often stop for breakfast or lunch on one of our walks. I wonder how he will feel about moving from the loud, odoriferous, frenetic streets of Rio to a land of quiet suburban sidewalks and perfectly manicured lawns. I wonder about how I will miss Brazil when I am no longer in Brazil, because I am sure I will miss it, but I can’t yet know to what degree, or for how long. I wonder if it will feel anticlimactic when I return home, as though my nine months in a far-off land may as well have all been a strange and surreal dream, as my world rights itself again and I return to all the normalcy I left behind. How will it feel to wake up in the morning and not be able to stroll to Sindicato Chopp or Cafe Terzetto, or the beach, or the lagoa just two blocks north of my apartment? Thinking about all this makes me sad. They say there are four stages of culture shock, and I am quite sure I have passed through the honeymoon phase (was there ever one?) and the “negotiation” phase, and arrived in the “adjustment phase,” which, according to Wikipedia involves, after 6-12 months, growing “accustomed to the new culture and develop[ing] routines. One knows what to expect in most situations and the host country no longer feels all that new. 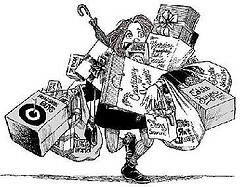 One becomes concerned with basic living again, and things become more “normal”. One starts to develop problem-solving skills for dealing with the culture and begins to accept the culture’s ways with a positive attitude.” All this seems to describe my experience perfectly. The irony is, just as all this is happening and the psychic shock of such a tremendous change in one’s world begins to fade, it is almost time to go. Now, I am off to a 4-day conference in Sao Paulo with Fulbright grantees from all over Brazil, Argentina, and Uruguay, before I return to Rio to finish out my contract. “Life after Fulbright” is one of the topics slated for discussion in Sao Paulo, and I’m sure that this will be extremely helpful as I face the next step of transitioning again and figuring out what life after Fulbright will look like for me. What will I do? Where will I live? Would I like to continue to live in Brazil? When I return to the States, will I want nothing more than to remain there? Will I finally write my book, or work in publishing or academia, or get a PhD? Fortunately, one thing I have learned here is to take one day at a time, and I am confident that the answers to all these questions will come in just that fashion: with time. I made it safely all the way from Rio to the state of Pernambuco and the final destination of the small historic town of Olinda over the course of 1,422 miles, along with surviving a night of getting stuck in the mud on a flooded backwater dirt road (my boyfriend dug us out by hand/[now-destroyed] Reef sandal over the course of 1.5 hours, acquiring multiple leaf-cutter ant bites on his bare feet all the while) in the state of Alagoas. This was before three phantasmic horses appeared out of nowhere on the deserted road behind our rental car, one horse white, one black, and one red, standing and staring as stilly as statues as midnight drew near, before they suddenly disappeared (seriously). I have approximately 20 mosquito bites polka dotting my legs, there was a small gecko that would not leave the wall of our pousada for two days, and our last hotel room had an infestation of wormy-looking centipedes. Such is life in the wilds of the northeast! Nonetheless, it was unbelievably beautiful there and every day was an adventure. Now back in Rio, I return with lots of pictures, some sort of lingering tropical fever/flu, purportedly authentic Senegalese reptile skin couture from the Pelourinho in Salvador, peixe-boi paraphernalia, cordel literature (found at last!) from Praca de Se in Olinda, memories of an amazing Pernambucano dinner with Brazilian friends Julia and Caio, and, perhaps most unbelievably, a tan! Oscar Niemayer’s Catedral Metropolitana Bell Tower. The white dome in the background holds the Brazilian National Museum. In the hectic rush of the end of my first semester working at UFRJ, amidst bus strikes and police strikes, the influx of thousands of citizens into Rio de Janeiro from around the globe for the World Cup (and the ensuing madness), making travel plans for my winter break (yes, it is winter here), and a family medical emergency back home, I have failed to meet my blogging goals for the past few weeks (nor even really found the time to write much at all, in truth). That’s what happens when one is living abroad; life happens, and we may find ourselves unprepared for the unexpected, but we maintain the impetus to forge on, regardless. The year of Brazil’s Copa do Mundo has really been one of the most interesting possible times to spend two academic semesters living in Brazil. I think I have met more people of more nationalities, and heard more languages spoken in one venue simultaneously than I ever will again in my entire life. Rio has become the world’s doorstep into Brazil, and die-hard fans from across the globe (as well as the curious who simply want an excuse to visit what they imagine to be an exotic and far-away place) have gathered here: Argentinians, Mexicans, Chileans, Dutch, Germans, Bosnians, Croatians, Spaniards, Portuguese, Italian, British, Aussies, Nigerians, Algerians, Ghanaians, Swiss, Russians, Colombians, Japanese, South Koreans, French… and so on and so on. It is an amazing experience to walk down the black and white winding sidewalks of Copacabana and overhear conversations in dozens of languages as citizens from around the globe proudly bear their team’s colors and wave their flags. Life is more or less on hold in Rio. Days on which the Brazil team plays, or there is any game at all being held at Rio’s Maracana stadium, are “holidays,” with most places of business closed down, except of course the bars and restaurants equipped with big-screen TVs around which dozens of fans gather and imbibe copious amounts of Brahma beer. And, if there is a Brazil team win, or even a “gooooolllllllll!! !”, be prepared for fireworks to go off around the city, screams of joy to echo down the streets, groups of inebriated Brazilians to run down city sidewalks joyously (clad in their team’s yellow and green), and of course, later on, evening house parties in neighboring condos with loud laughter and bass thumping until the wee hours of the night. 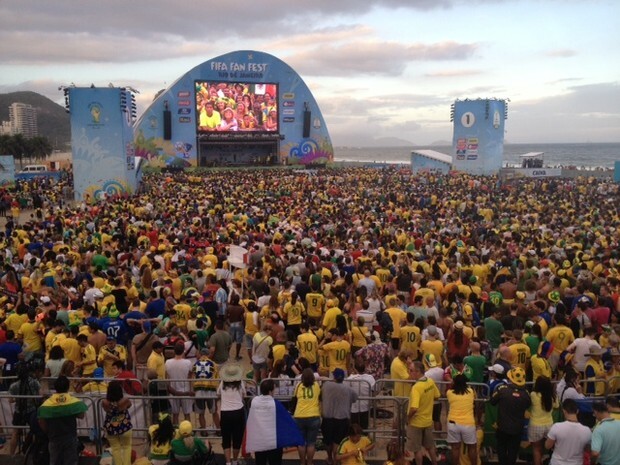 Thousands revel on the beaches of Copacabana on the opening day of the World Cup: Brazil vs. Croatia. For those who are unable to procure tickets to Maracana, Rio’s stadium, for a game (which is a feat virtually impossible–and extremely expensive–at this point), or who want to stay in town rather than venture to other stadiums across the country, there is “FanFest” at Copacabana, the one-stop shop for beer, fan-babes in skimpy bikinis, musical entertainment, souvenirs, and,of course, the coup d’etat, a 133 square meter HDTV broadcasting the games live. 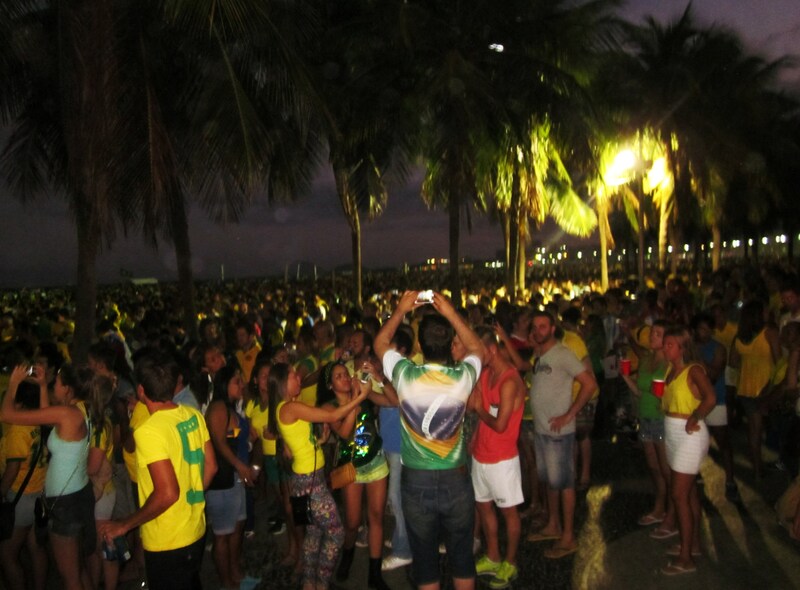 FIFA FanFest Rio, located on the sands of Copacabana Beach, can accommodate up to 20,000. Amidst the craziness of Rio during the Copa, and influenced by my own desire to attend a World Cup game (after all, I am in Brazil–once in a lifetime, right? ), I somehow managed to nab two tickets via FIFA.com to attend the Portugal vs. Ghana game in Brasilia on June 26. 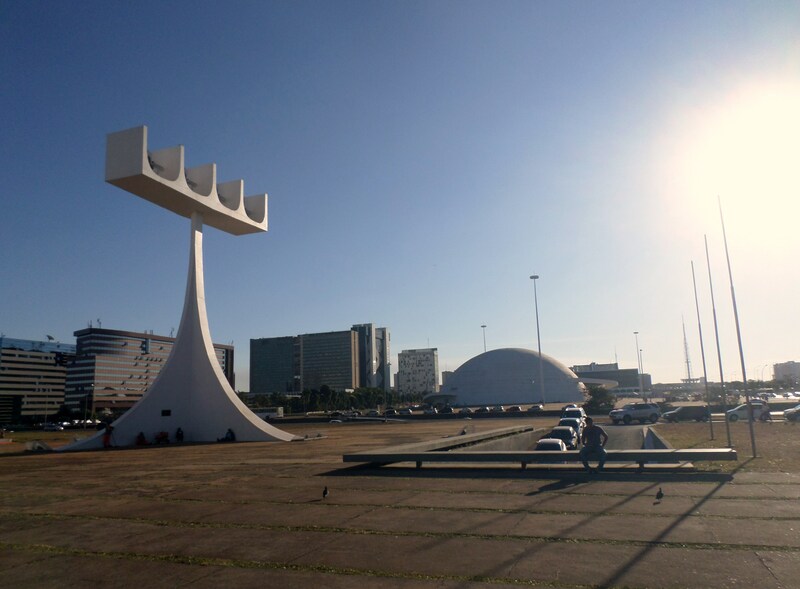 Brasilia was Brazil’s first planned city, a new capitol erected in the vast space of the plains of the Brazilian interior in the 1960s in just three years. It was designed in the formation of an airplane, intricately planned in an orderly grid, with various sectors marked for hotels, commercial zones, residential zones, etc. In the “cockpit” of the airplane sits the Praca de Tres Poderes (the Three Powers Plaza), in which the three government branches are each represented by the presidential office, the National Congress, and the Federal Supreme Court, respectively. People seem to either love or hate Brasilia. Some feel it is cold or sterile and lacking in culture and personality. Others truly appreciate the order of a city in a country where chaos often reigns. As for me, I enjoyed the trip, and the other-worldly feel that the unique architecture of the city helps create. 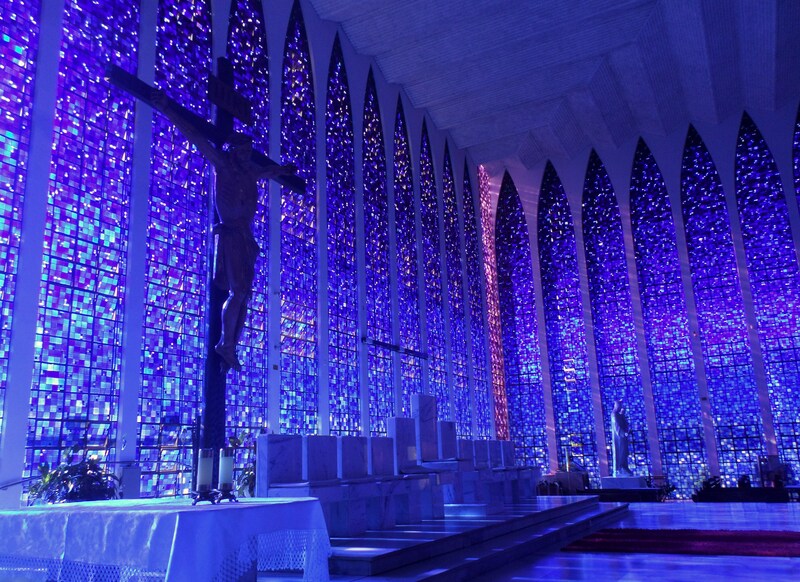 There are some truly beautiful monuments and churches in Brasilia, and my favorite by far was the absolutely breath-taking Santuario Dom Bosco. 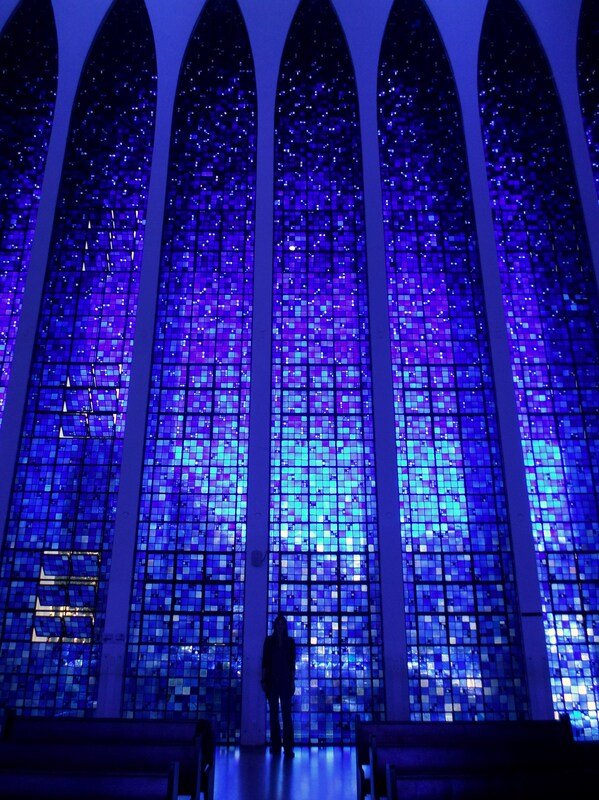 The sanctuary is decorated with stained glass in 12 shades of blue, and is designed to evoke the feeling of a star-filled night sky. At the altar lies a massive 10-ton block of pink marble. As for the game, seeing a World Cup match at the beautiful Estadio in Brasilia was a lot of fun (although I must confess, I missed the spirited Portuguese-speaking TV commentators. Without them, the game was strangely quiet!). Happily, Portugal’s win in the match meant that the U.S. team would advance to the knock-out rounds (I should have realized this sooner, as, knowing very little about futebol, really, I cheered for Ghana the entire game, little knowing that if they won my country’s team (USA) would be eliminated from the Cup. The Portuguese fans sitting around me must have thought I was totally clueless. Whoops!). The biggest shadow cast over my life recently has been my younger sister’s diagnosis of cancer. She has a variety which is very treatable; nevertheless, the challenges of being so far from home when a family member is in crisis really hit me when I learned the news about two weeks ago. I miss her greatly, and wish I could be there to support her as she undergoes surgery and various treatments back in the US. Thank goodness for Skype. 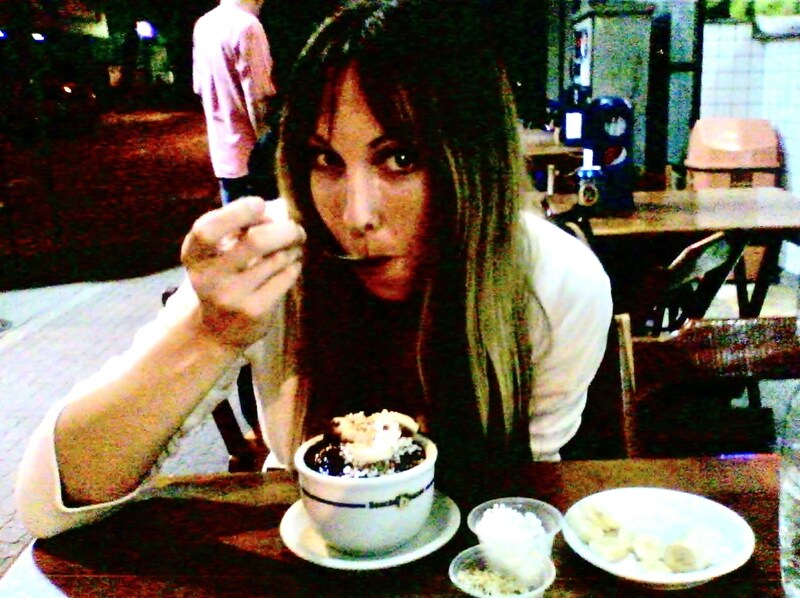 Three and a half months ago, before I arrived in Brazil, I was seriously concerned that I might starve there. You see, I had trolled message boards and forums and blogs, and had not found any information on living gluten-free in Brazil. In fact, based on my findings, Brazilians had a big penchant for (and pretty much only ate) pizza and pasta and fried breads and sandwiches (this penchant they do have, but they also eat many, many other foods). So, I relished my “final” gluten-free meal on-board my United flight, and, on a wing and a prayer, found myself touching down in Rio de Janeiro. Dear reader, allow me to reassure you: all my worries were for naught. I have now been in Rio for 14 weeks. I absolutely adore Brazilian food (it is so, so, so delicious). And if you happen to eat gluten-free, this will be no problem, especially if you live in a big city. For starters, the federal government has a pretty awesome regulation here, one which I wish also existed in the U.S. Every single food or beverage product is legally required to state whether or not it contains gluten. You will see CONTÉM GLÚTEN, or NÃO CONTÉM GLÚTEN on every single product you buy at the market, ranging from bottled water (see how thorough they are?) to candy, soups, and pasta sauce. Comida a quilo joints are ubiquitous. Select your food from a beautiful buffet and ensure that you will not be glutenized. Ask the waiter/chef at a restaurant if your meal contains “farinha de trigo” (wheat flour). They will be happy to answer your questions. In any case, gluten-free life in Brazil is great. The food is fantastic. And without further ado, I would like to introduce you to some of my new favorites. I don’t even know how to begin to describe the deliciousness that is pão de queijo. Imagine a soft, fluffy ball of goodness, delicately crisped on the blonde, pearly exterior, with soft, warm spongy dough on the interior. 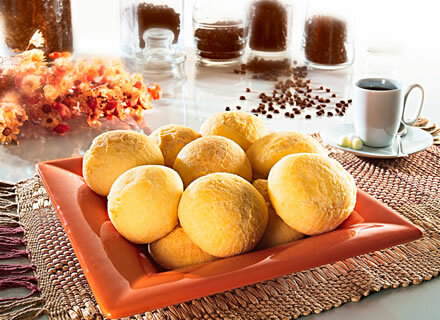 Pão is baked into bite-sized bits using tapioca flour (read: it’s gluten-free! ), which helps to create small air pockets inside, leaving you feeling as though you are nibbling on a decadent morsel light as air. The best thing about these perfect puffs is what awaits you in the middle: they are stuffed with soft, rich, white cheese. Mmmmm. A must-try. You can find pão de queijo everywhere, but I like to eat it when it is freshly baked and still warm. “Rei do Mate” and “Mega Matte” are popular fast-casual restaurant chains all over Rio, and both have good pão when it is fresh. Hailing from Southern California, I feel like I am inured to the latest fads regarding super foods, açaí among them. I first tried it about seven years ago, back in the U.S. Let me tell you though, you haven’t eaten açaí until you have eaten açaí na tigela (in a bowl) in Brazil. 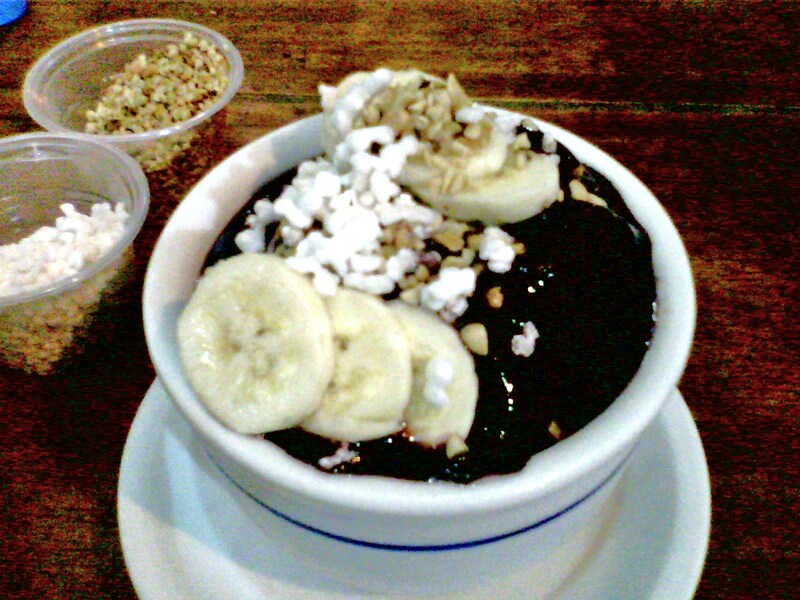 Açaí na tigela can be a breakfast meal or a dessert. It tastes a lot like sorbet: icy, refreshing, and tangy-sweet. Typically, guarana syrup is added to provide a sugar and caffeine boost, and to give the açaí flavor. Sugarless açaí, from what I have heard, tastes a lot like dirt 🙂 (I’m still game to give it a try, though, if I ever find myself in Amazonas). 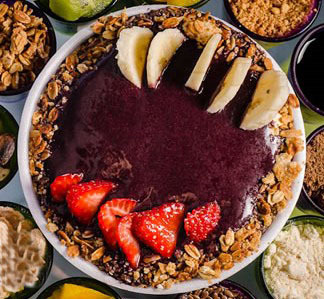 In any case, when you think of açaí na tigela, imagine your favorite ice cream or frozen yogurt, but packed with vitamins and antioxidants and with an endless assortment of healthy (or not-so-healthy) toppings to choose from to throw on. Whenever I order mine, almost always from “Beach Sucos” in Ipanema, I ask for banana separada (on the side, rather than blended in), tapioca (puffed tapioca crisps, basically rice krispies) and castanha do pará (chopped Brazil nuts) or caju (cashews). The resulting mix of flavors and textures, along with the resulting energy boost, provides a great way to start, or end, the day (and it’s totally addictive). Mineira cuisine is so fantastic that I couldn’t select just one dish to feature here. And although you may find Mineira food all over Brazil, the best is found in Minas Gerais, the state north of Rio de Janeiro where the cuisine originated. Once home to roving bands of horseback-riding bandeirantes, and with a rich (and sometimes treacherous) history of mining and hard labor, the state’s food is hearty for a reason. When I visited the historic UNESCO town of Ouro Preto in Minas Gerais for Easter in April, I dined at two amazing Mineira restaurants: Restaurante Casa do Ouvidor, and Chafariz, upon the recommendation of Lonely Planet. Both offered delicious fare. At Casa do Ouvidor, I shared a meal designed for two with my traveling companion, and we were not disappointed. 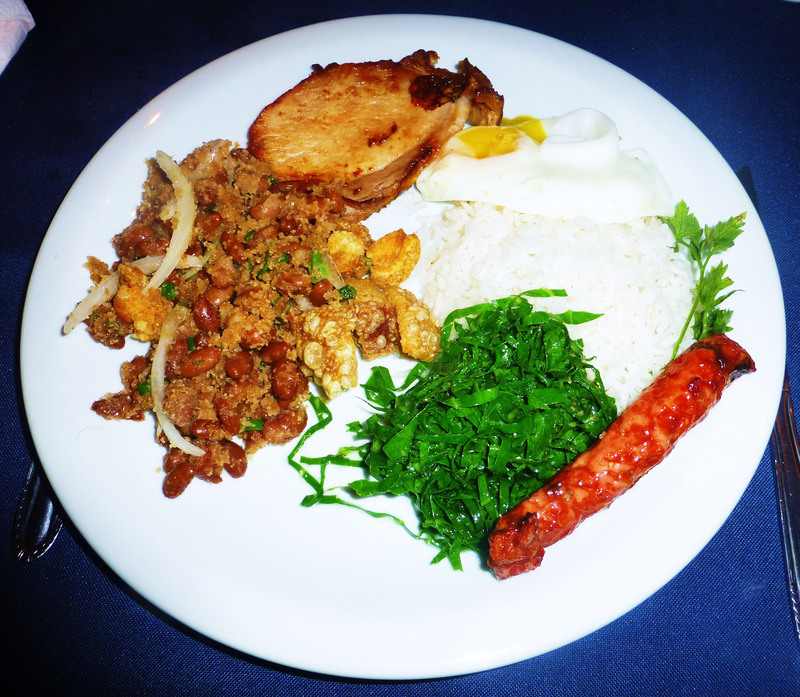 Our substantial “Tutu a Mineira” feast featured white rice, finely shredded collard greens, smoke-cured pork sausage seasoned with garlic and paprika, pork cracklings, fried egg, pork loin, and mashed beans. Chafariz, on the other hand, offered a giant buffet, with a spectacular array of items to choose from, including desserts and cachaça, a distilled spirit made from sugarcane. 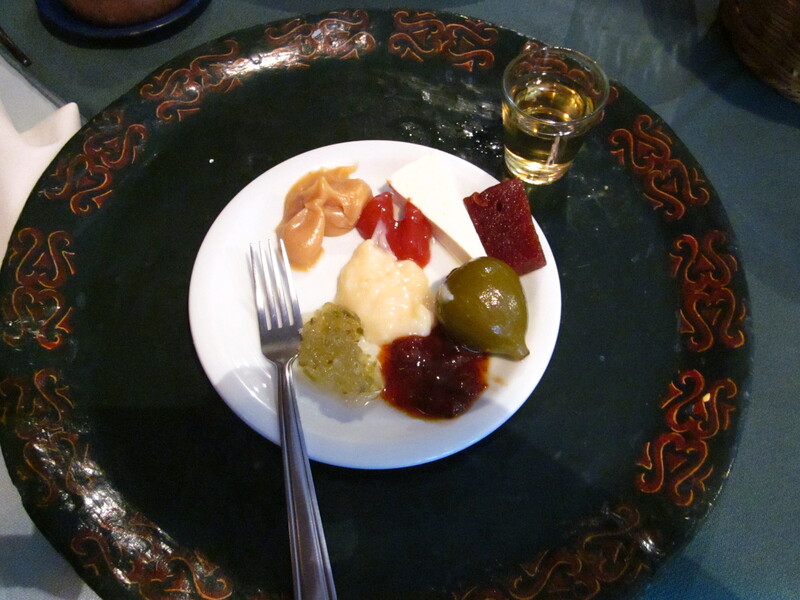 Mineira dessert is rich and varied. I sampled doce de leite, guava paste, candied banana and coconut and pumpkin, and a host of other delights, along with the staple shot of cachaça. Cachaça, by the way, is not particularly smooth, to say the least, although (based on my internet research) it is the third-most consumed spirit in the world. It has a fire to it similar to tequila, only more wild. It is not for the faint of heart! 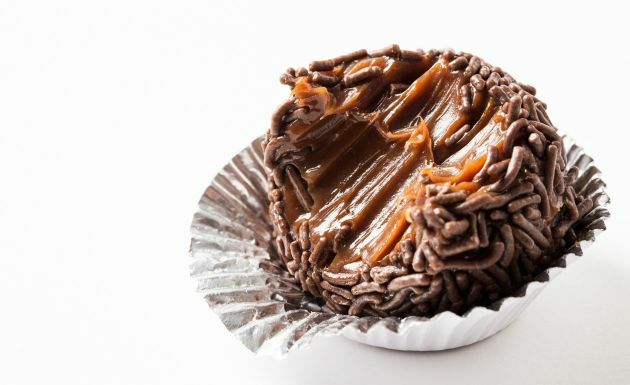 If you could taste heaven, it would probably taste like brigadeiro. This little, unassuming gooey truffle is a powerhouse of buttery cocoa bang, presenting a culinary foodgasm if you will. The recipe is simple: sweetened condensed milk, margarine, cocoa powder, and sprinkles for decoration. I’ve never made it myself, but it’s sold everywhere. The best I have found in Brazil is homemade brigadeiro sold by an elderly woman from a food cart on the campus of UFRJ in Rio. For a quick fix, it’s also sold at Starbucks all over Brazil (the dark chocolate version is gluten-free. Some versions are not–it depends upon the type of cocoa powder used). As I mentioned in the title of this section, I also prefer to eat my brigadeiro with a cafezinho, a tiny, strong shot of black coffee. The best cafezinho I have had is at Felice Caffe in Ipanema, as it has a rich, oaky, chocolatey flavor. I was never a big coffee drinker before coming to Brazil, but I have come to look forward to my little cafezinho shots with lunch or in the late afternoon. Last, but certainly not least: the Prato Executivo! This is my favorite meal for a night when I get home from work late, I’m eating by myself, and I’m famished but don’t want to linger long at dinner. The name translates to “Executive Plate,” and, from what I understand, was coined thus as originally it was intended primarily for traveling businessmen (executivos) who had to eat meals alone. 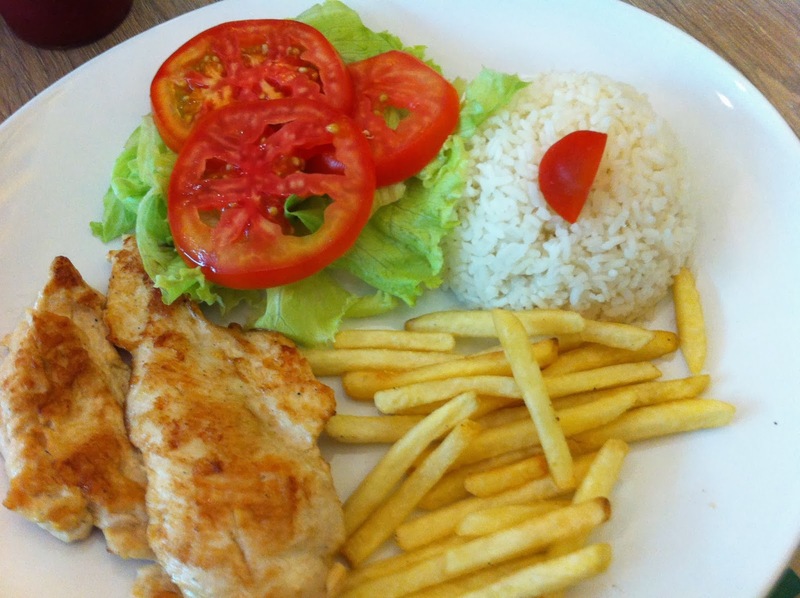 Meals are highly sociable times for Brazilians, typically enjoyed with large groups of friends or family, especially on weekends, and dishes are often served in portions designed for two or more. Though the executive plate is no longer just for businessmen, the name has stuck, a gracious epithet for us non-executives who find ourselves eating alone at dinnertime. The other night at dinner at Beach Sucos, a regular spot, I was happy to be handed the menu in Portuguese rather than English, as I always relish being mistaken for a Brazilian, or at least a savvy foreigner. I noticed the “Peito de Peru” section on the menu and called the waitress over to ask her what kind of Peruvian food the restaurant was offering. I had made the mistake of mixing up the words peito and prato (plate), thinking that the menu read “Plates from Peru.” The server looked very confused and shook her head in embarrassment as she backed away and motioned that she couldn’t really explain. I said, “é comida do pais de Peru?” to help her out, to no avail, as she only flashed an awkward, nervous smile. Later, I glanced over the same menu in English. Apparently, peru means “turkey” in Portuguese. And peito means “breast.” It would be interesting to have a menu featuring cuisine from the Breast of Peru. (I should have figured this out sooner, as when I taught a lesson to Brazilian students on reading & analyzing texts for appeals to logos, ethos, and pathos, they snickered, thinking I was saying, “logos, ethos, and peitos”). 1) A car. The truth is, I hate driving: the draining hours spent checking rearview mirrors, flying up and down southern California freeways in hours-long gridlock. There is traffic in Rio as well, but I can dodge it by taking the metro. Or I can travel by taxi or bus, and at least read, or meditate, or talk, without having to worry about tickets, fender-benders, or the non-working CD player in my dilapidated 2000 Toyota Celica. 2) Hair dye. I decided to go au naturale with my hair color before leaving, and allowed my highlighted blonde tresses to be colored back to their dark brown natural hue. I love it. I can’t believe I was so worried about not having a stylist here. It’s so humid, my hair always frizzes anyways, and it really doesn’t matter. It’s beachy. 4) Makeup. It’s sweaty. it’s hot. It just melts off. I get male attention all the same and save myself 20 minutes in the morning. 5) A TV and/or DVR. I’ve watched exactly one morning’s worth of TV since I got here. I have Netflix if I really have a hankering for a particular show, but I have found that the busier I am living life, and the more I say yes to new friendships and experiences, the more my desire to watch TV diminishes (the exception to this being the cinema: I will always love the excitement of seeing a film in the theater 🙂 ). 6) An iPhone. With internet access. And insta-Facebook, insta-Twitter, Instagram, et al. I have a cheap phone with a Brazilian SIM card that I can only use for basic calling and texting within Brazil. For international calls, I can Skype when I’m at home. When I want to check my social network newsfeed, I can wait until I get home. NOT having the iPhone 24/7 has been a liberating experience. I recommend turning it off for a while regardless of where you are. 7) Classroom accoutrements like computers, and internet access, and PDFs, and whiteboards. Or even paper handouts. I have found that a brief, stimulating lecture and a lively class discussion are all I really need to conduct a course. This has been a valuable lesson to me, as back home I had grown used to relying on YouTube clips and PowerPoints and webpages to supplement my classes. Having a two-hour block of time to fill, and just myself and a chalkboard and my students to work with, has challenged me as an educator and made me a better teacher. 8) Fluency in the native language. This one was a bit terrifying. But, from what I have experienced, for the most part, when you are in a foreign country and you are doing your best to communicate in that country’s language, even if you are still learning just the basics and make loads of mistakes, people will be very patient with you. They will listen to you prattling incoherently until they understand. They will be happy to help you. I have experienced this with people all over Brazil, ranging from taxis drivers, to a clerk at a mall who walked me to a different store and helped me to purchase cell phone dollars, to natives assisting in calling an ambulance when a friend had an emergency at the beach. Brazilians appreciate my linguistic efforts, though paltry at times, as I am putting in effort to learn their language, and they know it isn’t easy. I don’t doubt that you will experience the same in your travels. 10) Fancy clothes and jewelry. In Rio, I dress down. The city itself is casual and full of beachgoers. I don’t want to wear expensive items that would make me stand out in a crowd. I have met some girls who have lived here for a while, and they have mastered the art of always looking great and put-together in casual and comfortable tank tops, and hand-made Brazilian shorts, or long cotton dresses, and sandals, and non-expensive costume jewelry. These girls are my new fashion icons. And it’s great.